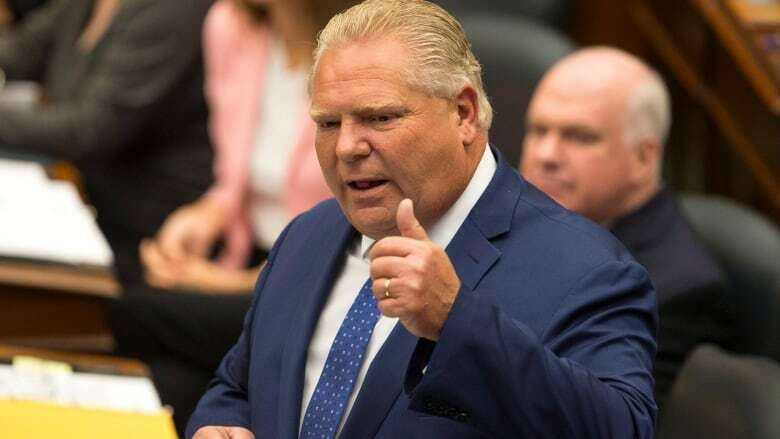 Doug Ford admonished protesting students for their "filthy" mouths on Tuesday after a group decrying cuts to post-secondary grants disrupted a session at Ontario's legislature by shouting obscenities at the premier. A handful of student protesters seated in the public gallery interrupted legislators by shouting chants of "free tuition" followed by profanity directed at the premier. Ford chastised the group and blamed the Opposition for influencing them. "That's how they train our kids, with a filthy mouth," he said. "They should have their mouths washed out with soap. That's what they should have, because that's embarrassing." The clash comes weeks after the Progressive Conservative government announced that it is ending free tuition for low-income students as it attempts to trim a $13.5-billion deficit. Critics say the move — which is being made in conjunction with a 10 per cent tuition fee cut — is harmful to those it purports to help. The government has said grants under the Ontario Student Assistance Plan (OSAP) had become unsustainable and it was time to refocus the program to provide help to students in the most financial need. The government also plans to make some fees paid by Ontario college and university students optional instead of mandatory, including those to student governments. Critics have slammed that move as an attack on free speech on campuses. Students rallying outside the legislature Tuesday said the changes will increase student debt and limit access to higher education for many. "We the students will defend access to education against these attacks," said Nour Alideeb, chairwoman of the Canadian Federation of Students-Ontario. "The government's plans to slash OSAP ... has devastated students and families across the country." The Elementary Teachers' Federation of Ontario and the Ontario Public Sector Employees Union joined the students in their call for a rollback of the planned changes. Training, Colleges and Universities Minister Merrilee Fullerton said she respects the students' right to protest on the grounds outside the building but criticized those who disrupted the legislative session earlier in the day. "In the chamber, I think we need to demonstrate respect all different ways," she said. "And make sure that people are heard and that they have an opportunity to protest outside if they wish but to maintain respect for the processes within the chamber." The protest comes a week after Ford accused student unions of getting up to "crazy Marxist nonsense" as he appealed for donations to his Progressive Conservative Party in a fundraising email. NDP Leader Andrea Horwath said Ford should be more mindful of his own conduct in the House, chastising him for getting into a shouting match during the morning session with several NDP legislators. "Mr. Ford doesn't like to be held to account," she said. "He thinks he's the king of Ontario. Well, he's not the king of Ontario. "Whether you're a student protesting outside or inside ... people have a right to be here and to show their displeasure in terms of the government's behaviour." Interim Liberal leader John Fraser said students are upset with the changes for good reason. "I think it's fair," he said. "[The government is] touting a 10 per cent cut, which is actually just a reduction in resources to universities."